I will never, ever pass up the chance to read a novel by Arnaldur Indridason, so when I saw that this one was being published, I hit the pre-order button so fast I may have broken a nail. Okay, that may have been an exaggeration, but I was rather excited to pick it up. one stack of the Indridason novels on my shelf (yes, I know keeping them on their sides is a bad thing, but shelf space is an issue at my house). Long before Stieg Larsson seems to have prompted the whole "Scandinavian noir" thing, books by Indridason and other Scandinavian writers were already fixtures in my home library. His books are among those which have stayed on my shelves while those by others that I didn't enjoy as much were given away, and there was never any doubt of their status as keepers. 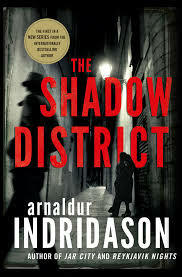 What I enjoy about these books the most, aside from his Inspector Erlendur and the rest of the cast, is Indridason's way of rooting modern-day crime in events in the past, and that is precisely what he's done once again in his newest book, Shadow District. Here though, he's done something a wee bit different. Not only has he once again dreamed up a contemporary crime that sets the stage for the past to come barging into the present, he has also made us privy to the ongoing investigation from the past as well. It is a very clever set up indeed. It all begins when the police do a welfare check on an elderly man whom his neighbor hasn't seen for a while. Letting themselves into the man's apartment, they discover his body laying on the bed. While the "death was not being treated as suspicious and no police inquiry would be judged necessary," there is still a post-mortem. The pathologist goes into her work assuming that he'd died of cardiac arrest, but it seems that's not exactly the case, as she discovers when she pulls something out of his throat. Turning the page expecting to see what it is that has caught the pathologist's attention, instead, we find ourselves back in 1944 during the occupation of Iceland. It is a "chilly evening in the middle of February," and a young couple out walking in the wind come across the body of a young woman behind the National Theatre. The man doesn't think it's a good idea to call the police, so they leave the scene. Page turn, and we're back in the present, where a retired detective named Konrád becomes interested in what is now being called a murder investigation when the lead detective tells him about some newspaper cuttings found in the dead man's apartment. It seems that the deceased had been looking at articles about a "girl found strangled behind the National Theatre in 1944," a case which for Konrád has interest because of a personal angle, and it is a case that, for some reason, was never brought to court. He gets permission to work on the old case while detectives are working on the murder. We don't really get too much about the present case as far as an active investigation goes (although Konrád does keep the detectives informed of his findings when relevant), but while Konrád is digging for answers, his discoveries are paralleled with the investigation into the 1944 killing by the two officers on the case, Thorson and Flóvent. In both past and present, things take more than a few strange twists and turns before all is said and done. As the blurb says, Shadow District is a "deeply compassionate story of old crimes and their consequences," something Indridason is known for in his work. It's also of historical interest, since not only does he get into the occupation of Iceland, but Iceland at that time was on the edge of independence, a situation that is clearly explained here. There's also quite a bit here about Icelandic folklore and folk beliefs which I found quite interesting and which fit nicely into the plot, and if you want to get a bit more into what's happening underneath the main mysteries involved here, just take a look at how Indridason gets into the changes on several levels brought about by the war. And then, of course, there's the team of Thorson and Flóvent who will hopefully reappear soon in another novel. When it comes down to it, there are a number of reasons that I'm happy to have read this book, but I do have to say that I had figured out the basic scenario just shortly after page 100. The actual perpetrator by name, no, but I did have an idea of where this story was going to lead and as it turned out, I was completely right. I can't say how I knew without bringing in spoilers but I just did. Now here's the thing, and it's the reason my husband hates watching crime shows on TV with me, and to be fair, it's probably not the author's fault: I've read so many mystery/crime/detective novels over the years that it's getting easier and easier to start reading a book like this and have a general outline in my head of how things are going to play out before I get too far into it. Seriously -- it's like something goes "ding!" in my brain and I just know. 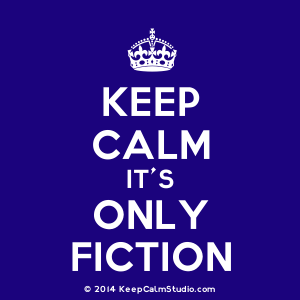 It's excruciatingly frustrating at times, as it was for me in this book, but I have to say that since this happens so often, I have learned that I have to look beyond the anticipation of the solution to the writing and to the journey. Here, the joy is in the interplay between past and present, following Konrád as he tries to piece things together in the present following the same path as the investigators in 1944. And then there's that central question here, which is this: why was the dead man so interested in the case before he died? Count me in on the next Indridason novel. I'll make shelf space for it somehow. I have liked the Erlendur series. I put this one on reserve at the library and sent this review to a few friends.